About a year ago in the start of 2017, I embarked on a series of small power electronics projects - compact and high-power boost drivers for LED flashlights. These LED drivers enabled multi-die 6V or 12V LEDs to be driven from single-cell lithium batteries (such as 18650s), at very high power levels. These projects started with the GXB20 (Rev 1 and Rev 2), and then the GXB17. These flashlight drivers turned out to be quite successful and the results allowed me to build some small but very bright flashlights, exceeding the brightest flashlights on the market in their size category (at time of design in early 2017). As I started going a little deeper into the rabbit-hole, I soon found myself asking the question - could I make these small flashlights even brighter? This was the motivation for the GXB172 project. The idea was partly a just-for-fun project to see how bright I could make a compact flashlight be, though more importantly, I saw this undertaking as a fun intellectual engineering challenge, and as an excuse to play around with some small form-factor power electronics. This was a breath of fresh air compared to some of the big power electronics I've been working on for my Solid State Tesla Coils (see the rest of my website for more on those). This page outlines the design and creation of what I hope will be probably the world's most powerful small size 17mm single-cell flashlight boost driver (at time of design early 2018, at least). I've done my best to try to document this project as it goes along, and hopefully other hobbyists will be able to build their own GXB172 driver, as well as build upon it to make it even better. Finally, a caveat - practically speaking, this driver doesn't make much sense! Driving an LED at 50W necessarily leads to significant thermal heating, which in a small flashlight (where a 17mm driver is needed! ), is physically unable to sink for any more than several 10s of seconds to a minute, and thermal overload will necessary occur. We can't beat physics here! The GBX172 is the 2nd version of my 17mm form-factor boost-type LED Flashlight driver, capable of 50W, hence the addition of the 2. It uses a completely different control topology from the GXB17, as well as different power components. A year ago in 2017, I developed the GXB17 and GXB20 flashlight drivers. These were simple constant-current single-cell, programmable, boost LED drivers, made specifically to run multi-die 6V or 12V LEDs at high power levels, around 20W. The new GXB172 builds upon the GXB_ _ line of drivers but significantly increases power handling capability to 50W, and adds a bunch of additional features including better thermal regulation (including PID options), and 4 times as many brightness levels (1024). Keep in mind that this project was designed as a fun hobby endeavor, and definitely not designed to be a commercial driver - i.e. no optimization was made for cost, component count or ease of fabrication. That said, it's a fairly full featured driver and I hope it will be something all hobbyists can enjoy. Here you will find downloads available for you to build your own driver as well. Note: If the flashlight holds 2S, why not use a bigger driver? If you plan to use two 18350s, why not just one 18650 for higher overall capacity? As a result, I do not expect I will develop a 2S version of this driver.. Note: This driver draws a significant amount of current at boost modes, over 15A from the cell. 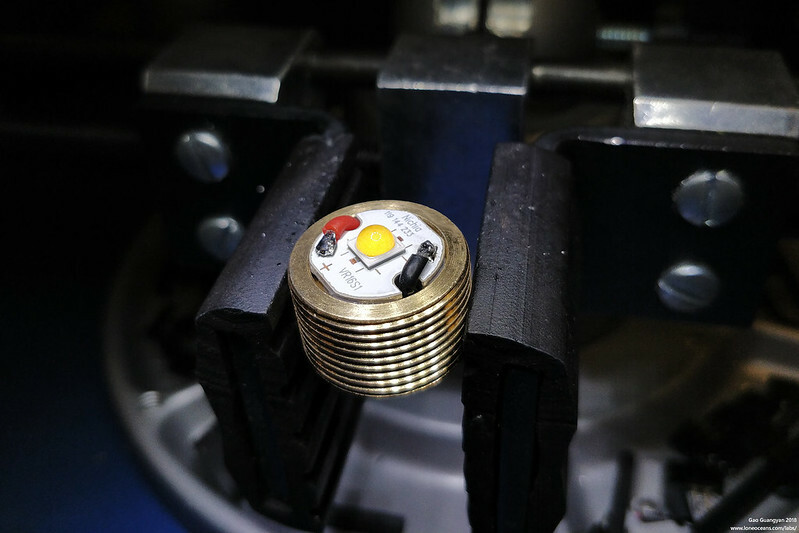 In typical flashlight builds, the tailcap switch and flashlight / contact resistance becomes significant. 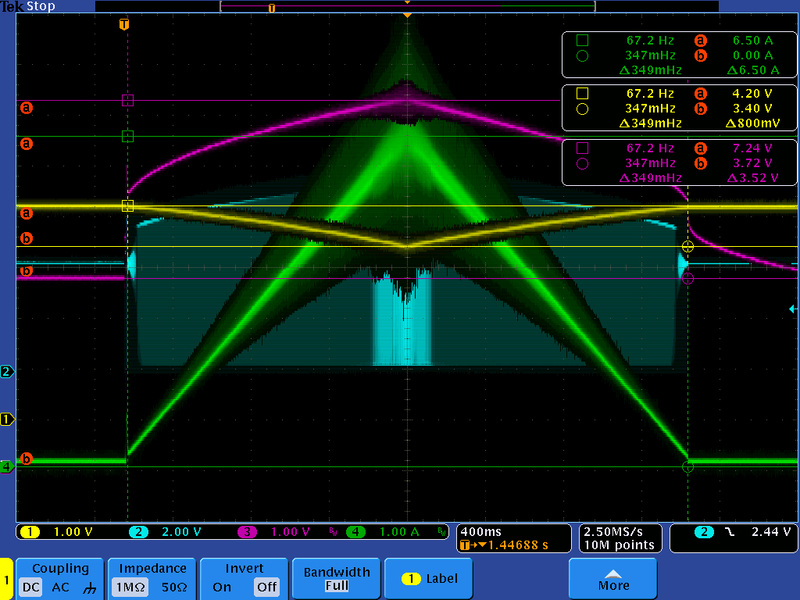 Imagine just 30mR of contact resistance = 0.45V voltage drop. When supplying 15A, the cell voltage can drop to 3.5V or lower. With the 0.45V voltage drop, this can allow the voltage presented to the driver to be 3.05V. As a result, the driver will require more current, leading to a larger voltage drop, leading to a lower voltage etc. This feedback loop can quickly cause the voltage seen by the driver to hit the low-voltage battery threshold and turn off. As a result, I highly recommend replacing the tailswitch with a FET driven switch inside (see below for my GFS16 tailswitch system), and making sure the electrical path from the negative terminal of the battery to the flashlight driver (via the body and screw threads) be as low-resistance as possible. Hopefully this will also be a useful resource for many like-minded hobbyists around the world who are also fascinated by flashlights and power electronics The GXB172 design including schematics, layout, firmware, and architecture etc are available on this page under the Creative Commons License. Errata for Rev A - silkscreen of C10 is hard to see, C10 is placed above R11. R11 is above R13. Change for Rev A2 - Improved silkscreen and positioning of components. Added bleeder resistor R15, 560R 402 works great. Note - The OPA333 op-amp (U3) is very sensitive to heat. The part can be reflowed no greater than 250C for the absolute minimum time. Hand solder is OK with care. Overheating can affect input offset significantly, leading to poor low-mode performance in the driver. U4 (temperature IC) is a tiny 4BGA package - recommended soldered via reflow / hot air at lead-free temp. Not additional paste needed (add flux). Parts list are for nominal 6V output with 1S input, different values required for 12V or 9V output (see BOM for details). Thanks to the BLF community, including Schoki, Texas_Ace, Schizobovine, Moderator007, Clientequator, and more, for feedback on the project and whose ideas and suggestions have helped this project, especially in firmware development. If you put together your own GXB172, feel free to let me know your feedback and comments by dropping me an email (contact information at bottom of this page). All feedback is appreciated. More details and information to come soon so please check back this page frequently. 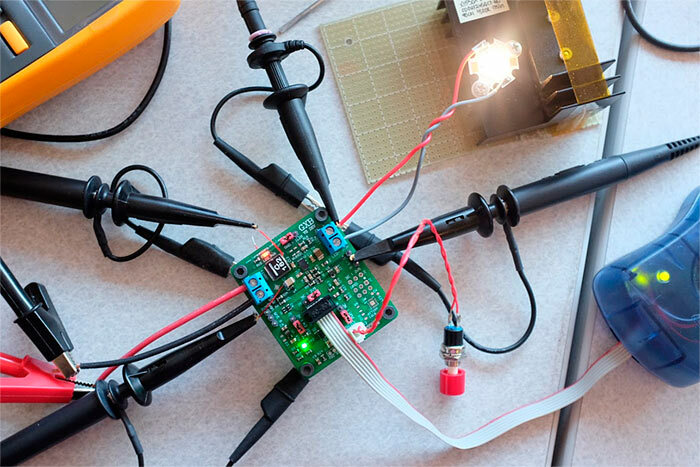 Putting together a GXB172 yourself is a tricky soldering exercise and not for beginners. Magnification recommended (even necessary). Best assembly using solderpaste and reflow oven. 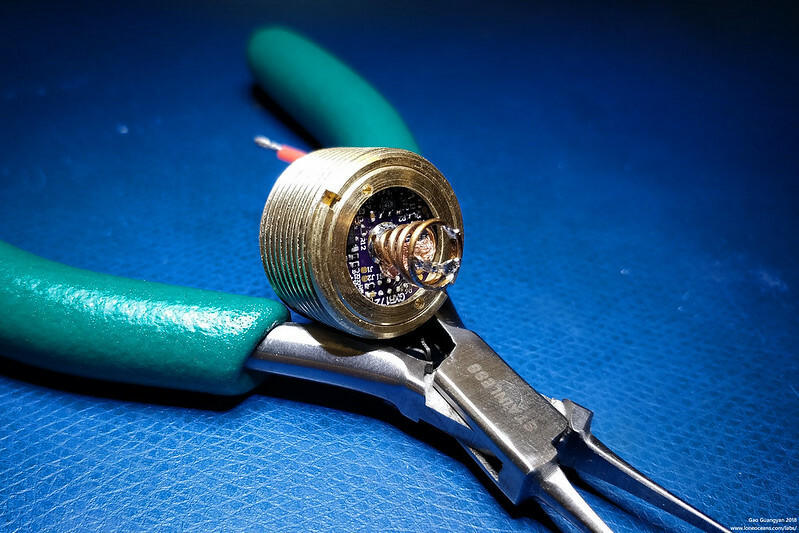 Individual components can also be hand-soldered via very fine soldering irons. Recommended to solder inductor side first. (Mar 2018) - The GXB172 Rev A design is complete and verified working! (May 2018) - The GB202 Rev A design was made from the GXB172 reference, into a SK98 host with CREE XHP35HI running at 2.5A at 14.7V and 2400lm output! 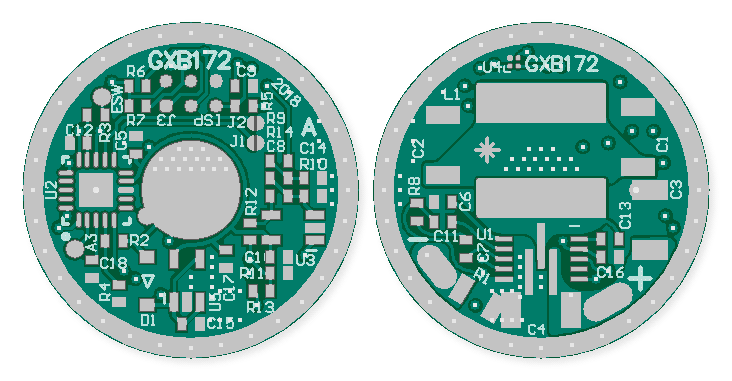 More information to come soon for the 20mm driver design. In progress (mid 2018) - a new build using a Convoy S2 full-copper host and XHP50.2 top-bin LED in progress for the ultimate 4000 lumen single-cell flashlight (awaiting copper host). Future Plans (2019) - As is the GXB172 is working very well, but I have more ideas for improvement... a GXB172 Rev B in the future? Several months ago, I created the GXB20 and GXB17 LED flashlight drivers, which were fairly high power 20W boost drivers. These allowed me to create small flashlights powered by a single lithium cell capable of emitting about 2000 lumens of light. At that time, it was a fairly big deal (at least to me), since most common and still fairly powerful single-cell flashlights we just about 1000 lumens bright, mostly due to the type of LED used (single die emitters). 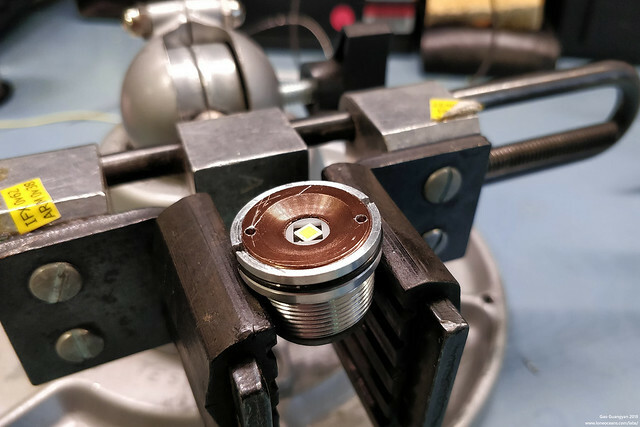 The key to achieving more light was to step up to one of the Multi-Die LEDs like the Nichia 144-series or Cree XHP50/35 etc LEDs, which typically have 4 dies bonded on a single substrate, connected either in series or parallel. This allowed a massive amount of light from a single small emitter, small enough to fit reasonably within a single-cell flashlight body. However, these multi-die LEDs require a step-up (i.e. Boost) converter driver, since they require ~6V or ~12V to run, depending on how they were configured (on PCB). The GXB V1 series of drivers achieved this using a TPS61088 boost converter, allowing for about 20W or so of drive power. At the time of completion, other than multi-emitter direct FET drive flashlights, there were essentially zero commercially available single 18650 flashlights capable of anywhere close to 2000 lumens. I suppose this made the GXB drivers somewhat unique! However, towards the latter half of 2017, this changed with the introduction of some commercial lights like the Zebralight SC600W IV Plus... 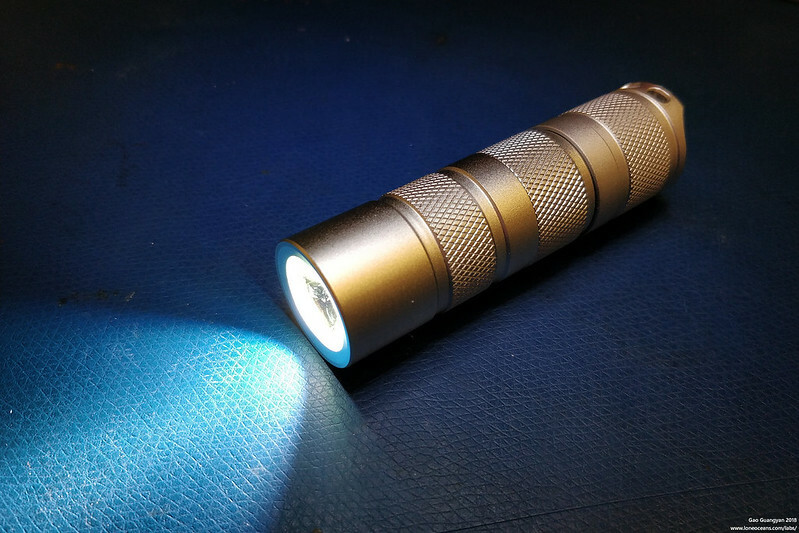 This flightlight is a single-cell light which also uses XHP50 LED... as a result, 2000 lumens for a single 18650 flashlight was now a (practical) reality! In the beginning of 2018, it was brought to my attention that there were at least two new flashlights that had been created in the recent months, both single-cell, and capable of some 3800 lumens! How could that be? Two such examples are shown above, the Imalent DN70 on the left, and the Trunite TC20 on the right, though I'm pretty sure there will be more by such flashlights since writing this page. As you can see, they are both (about the same size) fairly small! They are also both driven by a single 26650 lithium battery (fatter version of the 18650), and both use a Cree XHP70 LED, which is the bigger brother of the XHP50, and both have electronic side-switches. 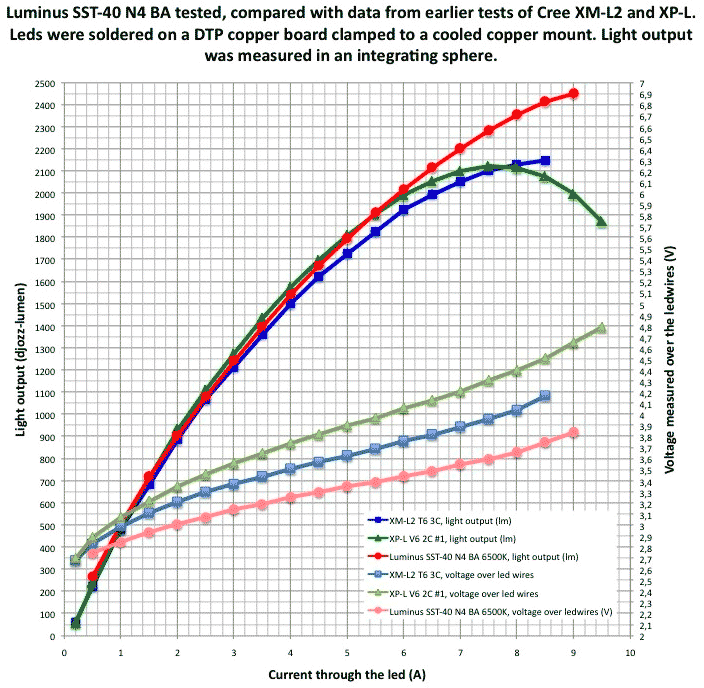 Now we know based on tests done by some fine members on the flashlight forums, that the XHP50 LED can in fact be driven all the way to over 4000 lumens, at a ridiculous drive current far beyond the datasheet ratings (4.8A datasheet), but it can be done. So this made me ask the question: is it possible for me to make a small 17mm driver, capable of pushing the XHP50 LED to the max (as well as the Nichia 144 of course! ), and create an even smaller flashlight capable of the same light output? When I was working on the GXB20/17 drivers, I had already chosen to use the most powerful integrated boost driver IC on the market, and was already approaching maximum drive output. I either needed to go for a double board driver setup (since board space was already very tight), or find some other trick in order to create the same driver size with twice the output power. How could this be achieved? .. I noticed some new max output current items, and these turned out to be new integrated ICs by Monolithic Power Systems, specifically the MP3429 and MP3431. A quick read of the specs suggests fully integrated synchronous operation, 0.8 to 13V input, 1 to 16V output, and a 21.5A switch rating! In fact, the datasheet boasts 30W operation from a single cell, and 50W operation from a 2S configuration! This has well over twice the power capability of the TPS61088 (which I used in the GXB17), and nothing even comes close as you can see from the parameters available above (the next step down to 11.9A was in fact, the TPS61088). A quick look at the datasheet also confirms that this was indeed a new product (dated 7th November 2017, it was not available when I was working on the GXB20/17 just a few months prior). We now have the key - a small Boost Converter IC capable of 50W of power. And so, the adventure begins! As with all engineering projects, we need to frame our problem well in order to come up with a good solution. As a result, I came up with a list of project goals and requirements, which I can then use to create the product. 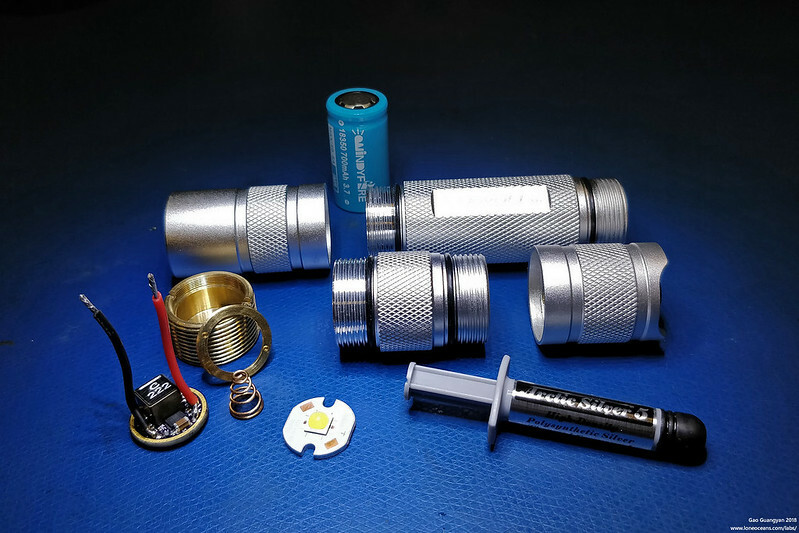 Overarching Goal - Create an LED driver for a single-cell small flashlight (18650 or 18350) capable of achieving 4000 lumens, and also still be sensible enough for simple, everyday use. Based on this overarching goal, we can immediately get into some design decisions which we will get to later. But for now, let's create a list of requirements that fall out of this. With these goals in mind, let's start with the mechanical design, then make our way to the electrical design. Right from the start, I know this will be a challenging project to pull off due to the very power drive requirements, so we will focus on every reasonable aspect of this build and take whatever marginal gains we can get! The first thing I wanted to do was to decide on a suitable platform to develop the GXB172 driver on. I wanted something of good quality but not too expensive, and something popular enough that the flashlight community was familiar with (and then could also then easily replicate my GXB172 project). After my excellent experience with the Convoy S2+ in my previous project, I decided that I'll use the same flashlight host to design my GXB172 driver for. You can buy the flashlights from Convoy's online store here. 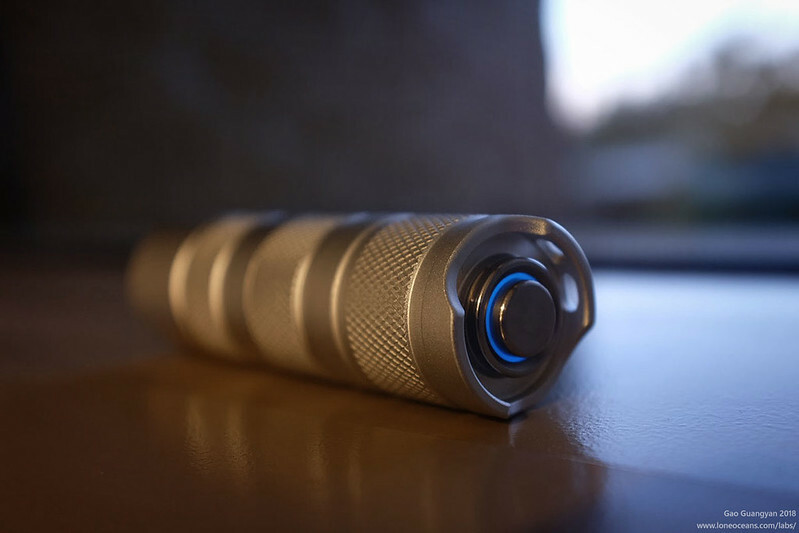 The S2+ flashlight comes with a threaded brass pill where the driver sits in. The driver needs to be 17mm, and sits on a small lip at the bottom of the pill, and is held in place around the edge via a threaded retaining ring which screws on the circumference of the driver. There is a fair amount of empty space above the driver, and we can make use of that in designing our driver. To make sure the driver would fit in the pill, I started by doing some careful measurements of the internals of the brass pill, so I could created 3D to-scale keep-out zones to make sure that any component assembled on the driver would not interfere with the pill. For example, having a component too close to the edge of the driver board might result in it interfering with the brass side-walls, or retaining ring. In my previous explorations with different hosts, you might recall that one main inefficiency in high current flashlights are the contact points, specifically the tail-cap switch. Now ideally I would like to go with an electronic-switch setup, but as of now I haven't yet found a nice, elegant host for this purpose. The Convoy S9 appears to be the best one yet, but for now, we'll stick with the S2+ as our benchmark mechanical reference. Choosing the battery spring for the driver is a small but crucial step in the design. With battery currents expected to be well over 10A, the choice of the spring both electrically and mechanically is important. The spring does the job of not only connecting the driver to the battery terminal, but also does the job of securing the battery tightly in the body. Typically for robustness and cost, steel springs are typically used. They can be made from fairly thin wire whilst being mechanically strong and robust, springy such that they do not deform over time, but suffer from very poor electrical conductivity. In fact, djozz on the BLF forums did an interesting test with various springs to find out exactly how the material of the spring affects it mechanical and physical properties. You can read the details here. In summary, steel springs have better strength and resiliency, but cannot compare to beryllium copper, phosphor bronze or copper/brass springs. Even gold-plated steel springs suffer from low conductivity. Djozz concludes from the test that bypassing the spring using a wire or copper braid is still the best, and I will definitely be doing it for this build. But regardless, we'll take as much marginal gains as we can! Finally, the last aspect is the size of the spring. We want the spring to be fairly large in order to be mechanically strong, but yet we want it to be as small as possible to take up the smallest possible footprint on our driver PCB... a contradiction. Or is there? To solve this problem, I simply flipped the spring upside down. Most 18650/18350 with flat-top (unprotected) construction have a 8-7.5mm flat area on the top, so this can be our spring size constraint. All that's left is to find a spring with say 7-8mm diameter at the bottom and ~5mm at the top, and made of a good high-conductivity material. After a little searching, I found what I was looking for on Kaidomain. 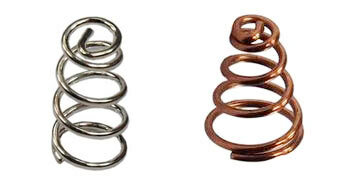 Specifically, the one on the left is a 5-6mm x 11mm x 0.7mm silver coated phosphor bronze spring, and the one on the right is a 3.8-7.6mm x 10mm x 0.8mm bronze spring. The latter seems especially attractive since it can be soldered upside down, taking up a very small board space, while the bottom end is still large enough to fit well the end of a lithium cell - though I'll be adding a small copper circle at the end for even better contact. This constrains our spring pad on the PCB to be about 5mm in diameter, and can also be used with the default 5mm spring I used in my GXB17 build. Finally, this spring will also be bypassed with a flexible wire for minimal ohmic resistance, ideally with silver wire! An alternative is to replace the spring with a solid contact, such as a copper cylinder or similar. This will have the least resistance, but will require a good, strong tail-spring to maintain battery contact in everyday use. 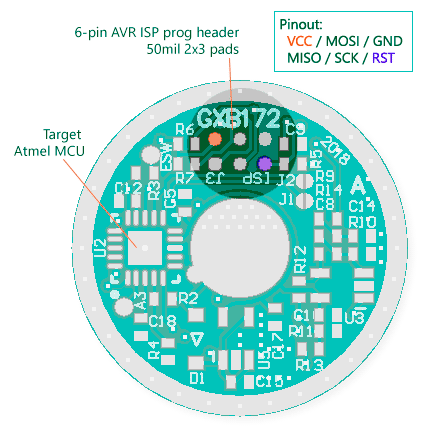 While working on my previous GXB17 and GXB20 drivers, both which use Atmel ATTINY MCUs, programming them was always a little bit of a pain due to the small footprint of the PCB, making connection to the AVR ISP header difficult. Experiments with 50mil-pitch headers and 6-pin Molex Slimstax headers proved to be less reliable than I was hoping, so I developed a simple pogo-pin programmer instead which I've called the PogoProg, or Pogo-pin Programmer. For more information about the PogoProg, check out my PogoProg page here on how you can make your own. The pinouts are the same as in the AVR ISP Mk 2 programmer and shown below. As you can see the idea is pretty simple. On the PCB there is a 2x3 50-mil pad connector corresponding to the 6-pins used for AVR ISP Programming. A small PCB with six spring-loaded pogo-pins are used to make contact with the pads. Although there are no alignment pins, I found this to be a non-issue since the sharp pins grab the copper pads fairly well. (I suppose the pads could be made with small centering holes). On the programmer there is a standard 100-mil 6-pin header for connection to the AVR ISP 2 programmer or ICE programmer. 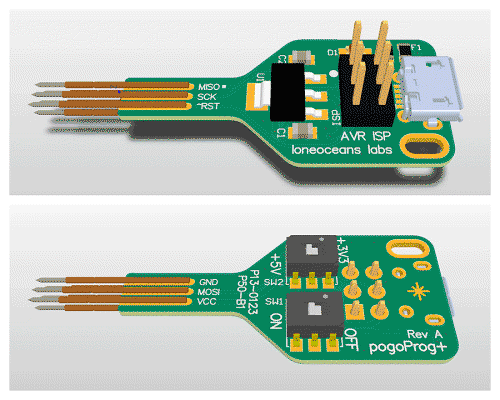 To avoid the need to power-up the driver for programming (since ISP does not supply power), the PogoProg also has a micro-USB socket to accept 5V power, and allows programming at 5V or 3.3V (with onboard regulator). I now use this programmer to program all my micro-projects and it works great! Please see my pogoProg page for more information. Just as important as the driver, if not more important (probably more! ), is the choice of LED itself. The LED is the one that directly converts electricity to light, and it's pretty amazing if you think about it, and all the work that went into LED development over the past 30 years or so to get to where we are here today. Indeed it was just a few years ago when Prof. Isamu Akasaki, Hiroshi Amano and Shuji Nakamura were awarded the Nobel Prize for Physics for the invention of the blue LED in the early 1990s, which makes our white LEDs today possible. It's also fun to see how I've progressed in my little hobby projects back from one of my first documented projects in 2003 where I made a LED mouse-pad using some of the first blue LEDs I could get my hands on! In this section, I'll describe the choice of LEDs for two purposes - (1) achieving as much light as possible and (2) creating the most beautiful light quality possible (while still being very bright). Goal - find an LED which has the most lumens per watt which can fit inside a small 18650 battery flashlight, and is capable of achieving over 4000 lumens. 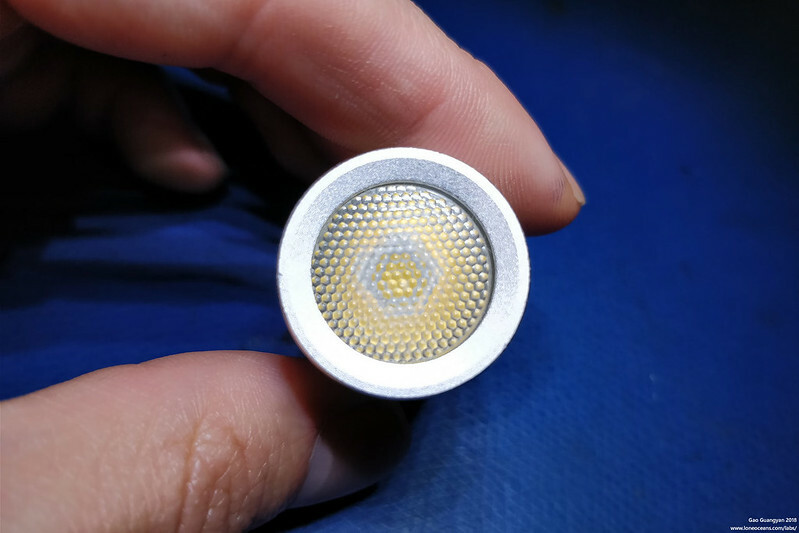 Unfortunately this rules out the Cree XHP70 LEDs which the DN70 and TC20 lights use (Since the XHP70 at 7mm is physically much larger than the already big XHP50 at 4.78mm, which it itself much larger than typical 3.5mm XML LEDs often used), but the choice is immediately clear - the Cree XHP50.2. 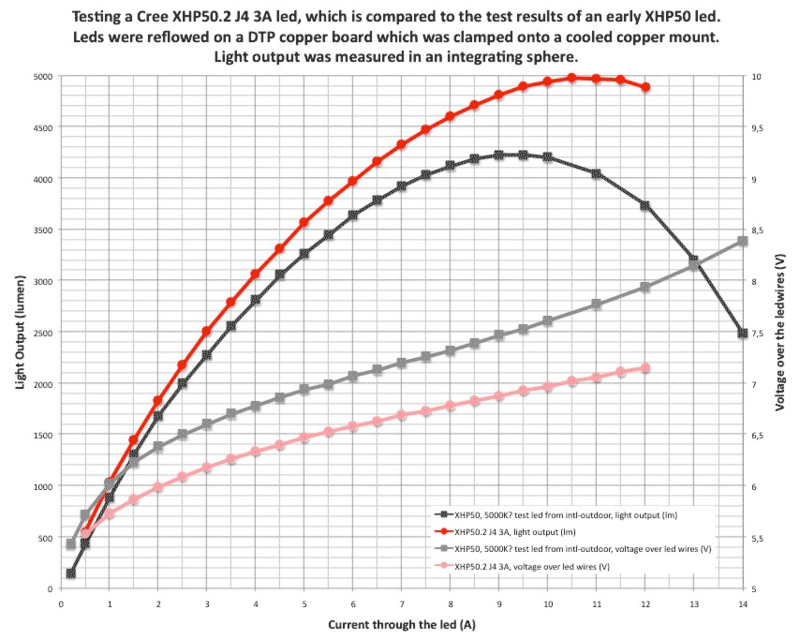 Above - graph showing Light Output and V_fwd against current through an XHP50.2 J4 LED and XHP50 LED, created by Djozz from BLF. 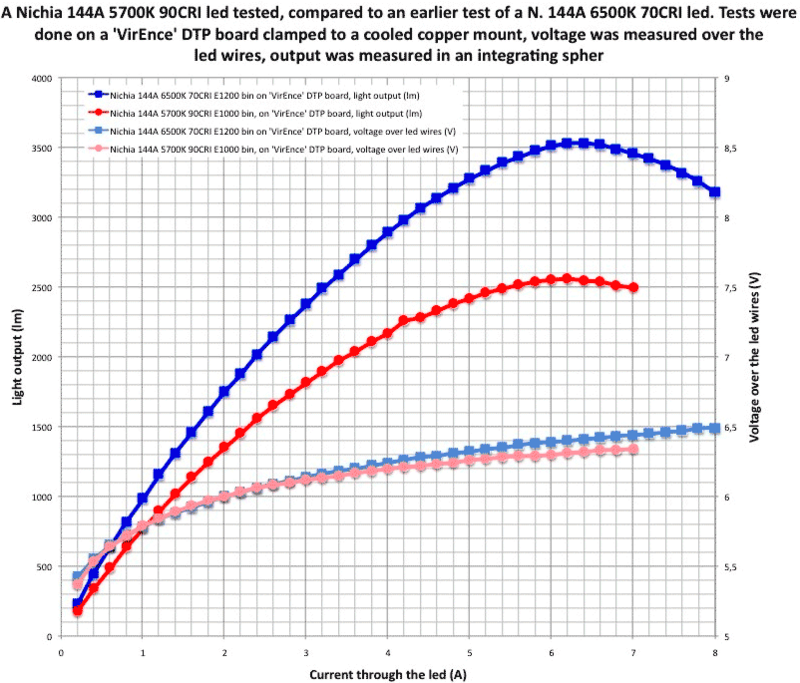 In fact, Djozz again from BLF has done a whole slew of tests on various LEDs and this chart above comparing a XHP50.2 J4 3A 5000K LED with a regular XHP50A is pretty clear. This thread describes it in more detail and all credit for the graph above goes to Djozz. Not only is the thermal resistance lower for the XHP50.2, but the V_fwd is also significantly lower but some half a volt. So the choice of our LED is clear - we want a J4 brightness bin (which is the brightest bin of XHP50.2 LEDs) XHP50B LED. 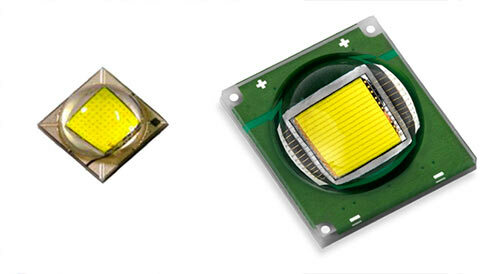 For heat-sinking, the LED needs to be mounted to a suitable, good metal-core PCB. 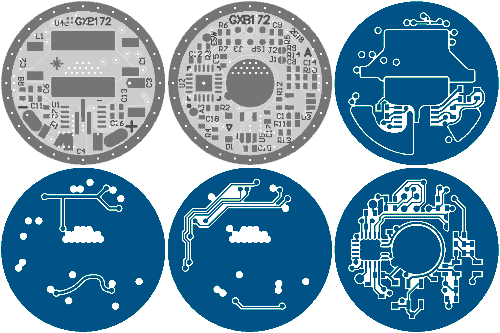 The best of these are metal-core PCBs (MCPCBs), where the heat-pad of the LED is directly bonded to a solid PCB core. It turns out that mountain electronics already sells a J4-bin XHP50.2 LED mounted on one of the very best copper-core (even better than aluminium!) 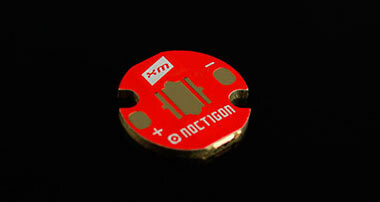 16mm MCPCBs made by Noctigon. So this will be our LED and MCPCB of choice. XHP50.2 J4-class on a Notigon MCPCB. The Cree datasheet rates the J4 class at 1239lm / 1120lm of luminous flux at 25/85C, at a nominal I_fwd of 1400mA. Unfortunately the datasheet only goes up to 3000mA (where relative luminous flux goes up to 180% or 2230lm), but stops there, so we will need to use Djozz's chart. So what do we need to do to achieve 4000 lumens? 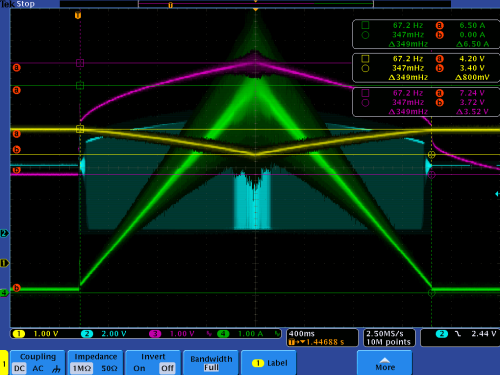 The chart puts us at a touch over 6A, and a corresponding V_fwd of just about 6.6V, for a total drive power of 39.6W. At 6.5A, V_fwd is still just over 6.6V (~43W), and light output is close to 4150 lumens. Based on this and with a driver and overall efficiency (including wires etc) to be say 90%, our driver needs to be able of handling ~47.7W in. We can design with the goal of having a ~6.5A 6.5V driver output or about 50W power handling, and a stretch goal of 65W in, 8A 7V out - well over 4500 lumens! 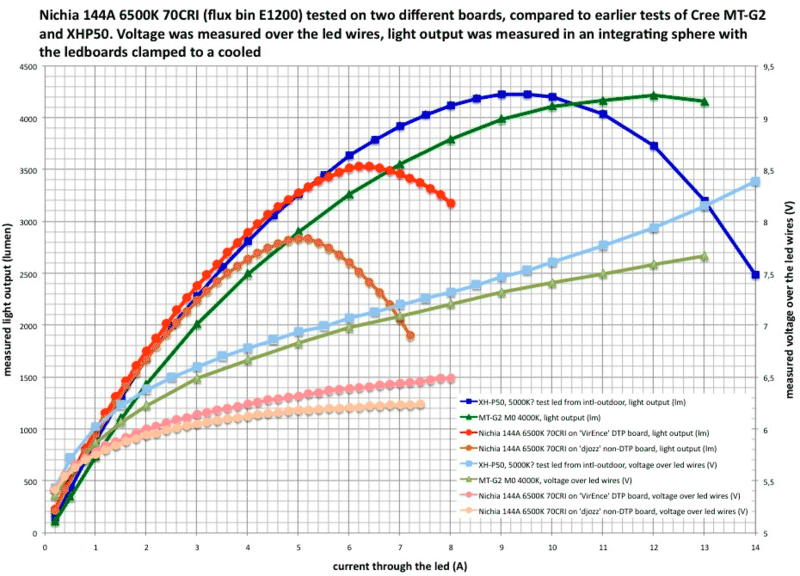 Now let's see how does that compare to a XHP70 that djozz also tested, to give an idea of how that will compare with single-cell commercial 26650 flashlights of comparable brightness. Again the above chart is from djozz in his XHP70 test (post 576). Here we can see that with the same 65W drive, the XHP70 achieves about 100-200 lumens more, so it is more efficient than the XHP50, but not by a huge margin. 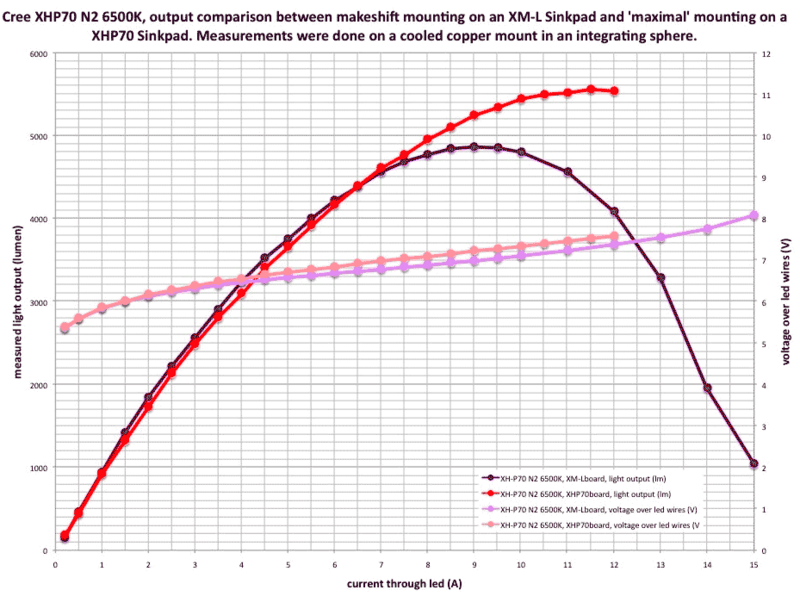 However while the XHP50.2 maxes out at 5000 lumens, the XHP70 does some 500 lumens more, though its clear at this point that thermals are the likely main limiting factor. If possible, we may try to fit a XHP70 into our small flashlight, though the target candidate is still the XHP50.2. For colour quality, we want an LED with a high Colour Rendering Index (CRI). Unfortunately high CRI LEDs are typically far less efficient than their low 70CRI cousins, but I think they more than make up for it with their beautiful colour. As a result, after achieving the goal of creating an extremely bright light, I'd also want a more sensible flashlight with amazing colour, but still being fairly bright. In my past experiences, I know that Nichia LEDs seem to produce a much nicer tint than the Cree LEDs, even the 90CRI ones. So I decided to try to see if I could get a Nichia LED to fit this project, instead of using a high CRI XHP50 (like I did in my previous GXB20 projects!). Fortunately Nichia does make some XHP50 equivalents - the 144 series! Like the XHP50, they are also a 4-die LED and are essentially four 219C dies mounted together. Unfortunately, they are not as easily available as Cree LEDs since Nichia does not sell to distributors like Mouser or Digikey. In addition, the 144 series has a completely different pad design than the Cree XHP50, so you cannot use existing MCPCBs. 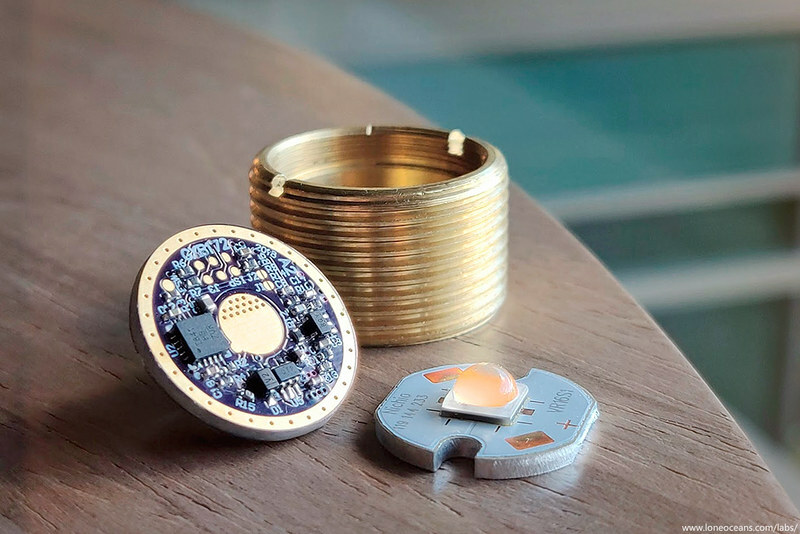 Fortunately, Clemence from BLF has done some amazing work with Nichia LEDs, and is now offering some of them for sale, and he has also created some custom MCPCBs for them too! The 144 LEDs measure about 4.65mm square, so they're a little bit smaller than their 5mm XHP50 competitors, but this means that they will fit our host light easily! I ordered some Nichia NV4W144AM sm563 E1000 R9050 LEDs from Clemence, along with his self-designed VR16S1 heatsink from his shop here. Many kudos to him for offering Nichia LEDs and his excellent self-designed MCPCBs to the hobbyist community. This project would not feature a Nichia emitter without his work! So how bright are these LEDs? Once again Djozz has done some great work testing out both a 90CRI and 70CRI version of the 144 LEDs here. Brightness of the LEDs are very good, in fact closely tracking a XHP50A in brightness up till about 6A (3500 lumens), before falling away. Comparing the red and orange, you can see again how thermals do play a big role in LED light output. The driving voltage of the 144 is very low compared to the XHP50A, but in line with the XHP50.2. As a footnote, I had to justify the reason for this whole project. Why is that so? Turns out, there is in fact a way of driving regular ~3V single-die LEDs via a single cell, using a very simple yet effective method to achieve extreme brightness - the direct drive method. This is also often referred to a a 'FET DD" method since the driver is essentially... a very low resistance MOSFET shorting the lithium cell directly across the LED, where the current is ultimately only limited by contact resistances, wire and switch resistances, and the resistance from the LED and battery! In real life, people often report some 6 to 9A of current drive. So I tried to find the most powerful single-V_fwd LED in a reasonable package, and I found the Luminus SST-40 and SST-90 LEDs. The SST-40-W comes in a reasonable 4.95 x 4.8mm size, but the SST-90 is a little too large at 10x11mm, so I'll only be considering the SST-40. Though it has to be said that the SST-90 is in fact rated at 4000 lumens at a whopping 18A (V_fwd 3.87V at 9A). The SST-90 is, at time of writing, the most powerful single-die emitter (which can be purchased easily and at a reasonable cost to consumers). Turns out djozz also did another excellent investigation of the SST40! So what does this claimed 15W 5A 1650lm on-paper LED have to offer? Well it turns out that the SST40 does track very closely to the Cree XML LEDs at the same current, but it did so with much lower V_fwd! Djozz reported that the LED died in the 'classic' way, where the bond wires on the LED melted. Based on this, we can probably safely say that the maximum you could push a single-voltage LED to is at 9.5A or so at around 4V. While 38W certainly is very impressive, it 'only' achieves a maximum of 2400 lumens and does so at significantly more power than my GXB20 driver. So even with a DD FET with one of the very best single-voltage LEDs, it's not possible to get to 4000 lumens reliably. Now the story is a little different with a 3-emitter (in parallel) FET-driven LED light, which is possible with a single 18650, and some 6000 lumens should be achievable!... but I suppose we won't have half as much fun as we are having now with this Boost driver design! ;). Having had some experience with my GXB drivers, the architecture of this boost system is actually fairly simple and essentially as close as 'textbook-style' as you can get! The heart of the driver is the MP3431/29 integrated boost IC. Below is the typical application, configured in constant voltage output, controlled via resistors R1 and R2. We need to modify this for constant current output instead. For the control system, I had previously taken apart a commercial H1-A 22mm boost driver and I decided that the control system was better than what I had used previously in my GXB17/20 driver since it used fewer components, so I have adapted it with changes. Essentially the control takes a low-side voltage measurement from a sense resistor, and compares it with an analog voltage generated via PWM from the microcontroller. In order to sense the current, the LED is driven from Vout of the MP3431, in series with a low-side current sense resistor, R_sense. The voltage drop across R_sense is fed into one input of a low-input-offset Operational Amplifier. The other input is connected to a filtered DAC output from our microcontroller. In this case, I'll be using a ATtiny841 to generate this analog value via a high frequency 10-bit PWM, low-pass filtered to provide a DC compare voltage, scaled accordingly. The output of the op-amp is then tied to the feedback pin of the MP3431, which is itself also tied to a nominal resistor feedback network (to produce the nominal 6V output). This completes the feedback loop and the system now has true constant current regulation. In order to perform the auxiliary functions, a 2.5V LDO provides a stable and accurate 2.5V rail precise battery voltage monitoring, generate a stable reference voltage for constant current control, to power a digital temperature sensor, and to interface with the EN-pin of the MP3431. The rest of the MP3431 is configured carefully to suit our specific operating requirements (such as choice of compensation network and operation modes - the datasheet describes how this can be done). The choice of this LDO is fairly straightforward and not too critical. I wanted a decent performance 2.5V regulator capable of ~100mA or so, and importantly, come in a small package size, and made sure it didn't need some sort of huge output capacitor for stability. I decided to use the SC-70 package due to it's availability, ease of soldering, despite its small size. A quick parametric search on Digikey for LDOs with SC70 package and 2.5V / >150mA and sorted for lowest cost reveals some choices including the TLV70025DCKR and TPS71725DCKR, good for 5.5 and 6.5V input. For our purposes of 1S operation, this is OK, but we will need at least a 10V input regular for 2S operation, and we may have to go up in size to SOT23 packages or other harder to solder ones. For now, either SC70 device will work just fine. In order to make programming work via ISP without back-powering the boost converter, a schottky diode is added in series. In the future, the TPS709/706 may be used instead to reduce part count since it has in-built reverse protection, but comes only in a 'large' SOT23-5 package, or harder-to-solder WSON-6. The constraints for the amplifier is simple. I needed a small Op-Amp capable of rail-to-rail output, capable of operating at the designed running voltage of 2.5V, have a fairly low quiescent current (<50uA), and most importantly, have a low input offset voltage (on the order of uV) and low drift over temperature. I did a quick parametric search on Texas Instruments and selected a low-offset voltage (<100uV), a miniature SC-70 package, a minimum voltage of 2.5V, and I was left with a few options including the OPA333, the cheaper version TLV333, and a lower spec one (OPA317). A quick search on digikey also confirmed my choice that the 333 series was indeed a decent choice. Since I'll only be building a few of these, the OPA/TLV333 is a good choice so I settled on this op-amp. I could have gone for smaller packages with excellent performance like the OPA2333P but they're a little difficult to solder by hand and cost $3+ a piece! I've managed to find some other op-amps as well including some from Micrel and Maxim, but they seemed a little more finicky to heat during hand-soldering than the OPA333 so I've stuck with that for now despite the price. I'd imagine they'd all do just as well if manufactured in a fabrication plant via proper reflow. In my previous GXB implementations, I used a NTC (negative temperature coefficient) resistor in a voltage-divider configuration in order to determine temperature readings. This worked ok, but the temperature-resistance relationship of the NTC was non-linear, and I wound up having to create my own look-up table, which was messy, un-portable, and not particularly accurate. As a result, I decided to use a dedicated temperature sensor IC this time just for fun (obviously, more expensive though). For this I decided to use the Texas Instruments TMP103, which is a low-power digital temperature sensor with I2C, and comes in an extremely small 0.76 x 0.76mm 4-WCSP package - basically the same footprint as our original 0402 NTC! It's capable of reading temperatures to a resolution of 1C and supports I2C and SMbus, perfect for interfacing with our MCU. It also operates well within our 2.5V supply range (1.4 to 3.6V). This particular device will be difficult to solder, but considering it's only a 4BGA, it should be very doable with a hot-plate, hot-air or reflow oven specially since the DSBGA already comes with solder balls on the device and all it needs is a good amount of flux and no additional solder paste on the pads to solder - it's easier than it seems! You just need some magnification and a good pair of needle tweezers. The boost inductor is the key component in a boost converter to generate a higher output voltage than the input voltage. In this design, the inductor is also the largest component. An inductor with a large inductance will result in less ripple current and lower peak inductor current, so we want to maximize the inductance of our inductor. However, increasing the inductance usually results in a combination of the following: increased inductor size, lower saturation current, and higher series resistance. We want to find an inductor which is as small as possible, yet have sufficient inductance, high saturation current, and low series resistance (at a reasonable cost!). Using fs = 500kHz, Vin = 3.5V, ΔI_L = 2.4A, we arrive at L = 1.64uH for Vout = 8, and L = 1.35uH for Vout = 6.5. According to the MP3431 datasheet, a recommend value for the boost inductor is 1.5uH, so this sounds very much in the same ballpark. Next, let's find out the required current rating for the inductor. To do this, let us assume the worst case scenario of our boost converter running at 80% efficiency. Hopefully in real life, this number will be greater or close to 90%. Let's determine the duty cycle D for the minimum input voltage (where input current is the highest) at maximum drive. From this we can calculate the peak inductor current, which the integrated switches and / or diodes also have to withstand. Where I_max is the maximum output current, which we will assume to be 8A, and 6.5A nominal. From this, we find I_pk = 19.77A or 16.28A, so our inductor needs to be able to handle this peak current without saturation. Note that this is also within the 21.5A maximum switch current for the internal FETs of the MP3431. 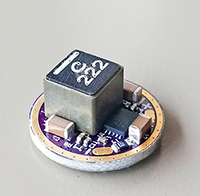 In my GXB20 and GXB17 builds, I used the Vishay IHLP2525CZ inductors which were quite decent high-saturating current inductors measuring 6.5mm square and 3mm thick. Looking at their 1.5uH inductor, it has a 14mR DC Resistance, and a 18A saturation current (where L drops by 20%), but the rating with a Δ40C is only 9A! So we need to look for an alternative. I turned to the IHLP2525EZ series which are the same footprint but 5mm tall, but the results were not looking too great either. I went one step up to the 3232CZ series, but even those proved to be insufficient. Next I turned to another company - Coilcraft, whose inductors I've used in my other power electronics projects, and I found some that were perfect for this application! After a quick investigation, it appears that the XAL7030-222 and the XAL7070-222 are both fantastic choices, with the latter being our first choice, and the former being the choice for really height-constrained drivers. With the fairly soft inductance roll-off, I expect both inductors to work fine. Since the Coilcraft inductors have such high current handling capability, I decided to go with 2.2uH instead of 1.5uH to reduce the ripple current. The choice of battery is an important consideration for this project. At full power draw, the driver can be drawing over 15A from the cell, so a high quality high-drain cell is required, which maintains as high a battery voltage as possible during high current discharge. Turns out a forum member HKJ on the CPF forums has been testing out various batteries over the years and has an excellent 18650 battery comparison site. One of the most popular high-drain cells is the common and well-regarded LG HG2 (brown). After some comparison, I settled on the Sony VTC6 (green) and Samsung 30Q (pink) cells as good candidates for this project due to their excellent discharge characteristics, capacity, and ease of availability. 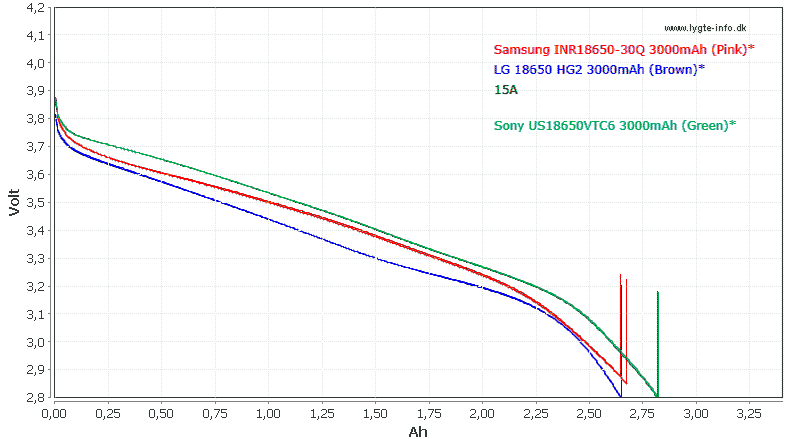 The chart above from HKJ's site illustrates the excellent performance of all 3 cells at 15A current draw, in particular from the Sony VTC6 which not only maintains a higher cell voltage, but also has the highest capacity in this discharge test. We'll use this for our flashlight build! With the electrical design done, it was time to do the layout. The layout is really what makes this driver 'work', since the schematic is all pretty text-book and rudimentary, but a lot of care needs to be taking for the routing, not just in terms of thermal handling, but also in terms of minimizing loop area for high current loops, keeping inductances low, and proper management of grounds. Layout was done using 4 layers to simplify routing. These days, 4 layer boards are relatively affordable. This board was designed with ease-of-fabrication in mind. As a result, I kept to OSHpark's 4 layer process with a 5/5 mil trace space specification, 10mil drill, and 4 mil annular ring. Using 4 layers instead of the 2 layers I constrained myself to in my previous projects, helped routing significantly. Certainly going 0201 and using 4 layers would be even more optimal, as would be using stricter PCB rules such as 4/4mil or 3/3mil! But then I wouldn't be able to order them on OSHpark or low-cost fab houses. Note that going to 2 layers bumps it up to 6/6 clearance, 10mil drill and 5mil annular ring. For reference, my previous GXB17 was done with 10mil drill 20mil via, 5/5mil clearance and width, 0.9mm/1.6mm vias for the output, though turned out just fine on OSHpark's 2oz 0.8mm process. A little bit of work later and the routing is completed. It's a little tight but I managed to keep all passives to be at least 0402 size or bigger, with the smallest component probably being the 4BGA temperature sensor IC. I might swap that one out for an alternative in the future, but it works for now. While I didn't give much optimization to this design, I did try to at least make a decent effort in making the layout be as electrically sound as possible. Care was taken to ensure best thermal performance as well as to reduce any sort of loops especially on the power side. Above is a render of how the board will look like populated. Notice how big the boost inductor looks like compared to the driver! I was also constrained to using 1206 input and output capacitors, though in real life you could stack capacitors for better performance. Ideally you'd want to be using 10V capacitors and 16V capacitors for the input and output sides respectively at 6V operation, or 25V in the case of 12V operation. Input power comes directly across the perimeter of the driver, and the centre spring. Output terminals are the two oblong pads on the inductor-side of the PCB. The GXB172 is a fully-featured programmable LED Driver, so we need to write a little bit of firmware to handle all its features. 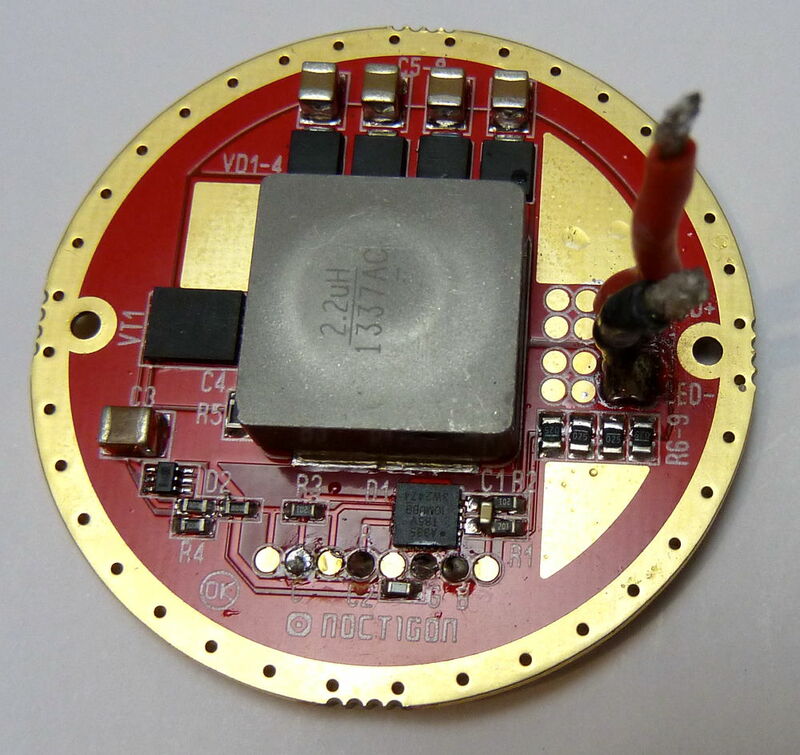 The target MCU chosen for this project is the ATtiny841. I chose this particular controller primairly because it came in a diminutive 3x3mm QFN package, as well as having a decent 8kB of flash, 512b of EEPROM, operating range down to 1.7V, two 16b timers, internal oscillator, and fits well within the Arduino environment which I hope would be easy and friendly to anyone hoping to build their own GXB172 or write their own firmware for it. It's no fun to work on a tiny 17mm PCB, so for development purposes and to test functions out, I created a development board, allowing me to test different functions, conduct measurements, debug, etc all on a convenient platform! I knew that I wanted to incorporate some fun new features which I thought of only after developing my GXB17 and GXB20 drivers, and I figured that a simple 'dev board' would allow me to (1) much more easily probe the board and (2) allow much easier firmware development. I also added hooks for soldering on a second MCU (the Atmel Attiny1616 is an interesting candidate since it's one of the new ones after the Microchip acquisition), but for now I've gone with the Attiny841 which is more capable than the Attiny85 or 84A I used previously. After about a day of work, I completed the GXB Rev 2 Development Platform board. As you can see above, the dev board allows me to connect a whole bunch of probes to it, my AVR ISP programmer, as well as input and out via screw terminals, debugging LEDs, an E-Switch for E-Switch development, and two footprints for different MCU options if desired. Testing and firmware development was done with a very powerful bench power supply, and a XHP50A-00-0000-0D0UG20E2 LED configured for 6V operation, mounted on a large heat-sink as shown above. The Dev board allowed me to finalize the electrical architecture of the system and to easily develop firmware for it. The above flowchart shows the general operating states along with error and fault conditions. The number of modes, memory, special effects, battery cut-off, thermal regulation etc can all be adjusted to whatever the user wants. Note that the temperature thresholds are subject to change (see chart below). Writing the firmware was actually a little more involved than it seems because there are several tricks that are taken into account to ensure that the system runs properly, and handles things like initial voltage sag during turn-on in a robust and intelligent manner, among others. Firmware version 1.0 has the follow default values as well as different mode groups depending if X1 and X2 jumpers are set or not. Open jumpers (default) are 1, shorted/bridged jumpers are set as 0. More work to follow on the firmware when I get more time. I already have many ideas how to improve it. 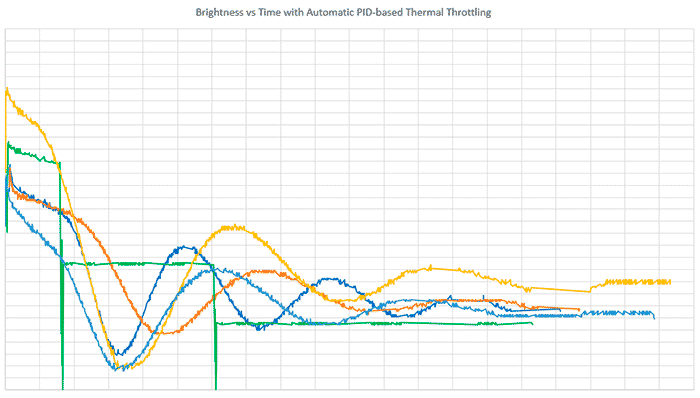 One key aspect I worked on for a fair bit was the PID thermal control, which aims to keep the flashlight at a fixed set temperature when on boost modes. To do this, I had to optimize the system with the flashlight case in mind, and conducted several measurements with different PID coefficient values (some examples shown above) to arrive at something practical and useful. The nice thing about this system is that the driver will never cause the light to get too hot, and external cooling of the light (e.g. immersing in water) will allow the system to automatically ramp up the brightness (up to the set mode). The first stable firmware v1.0 was completed in Mar 2018. 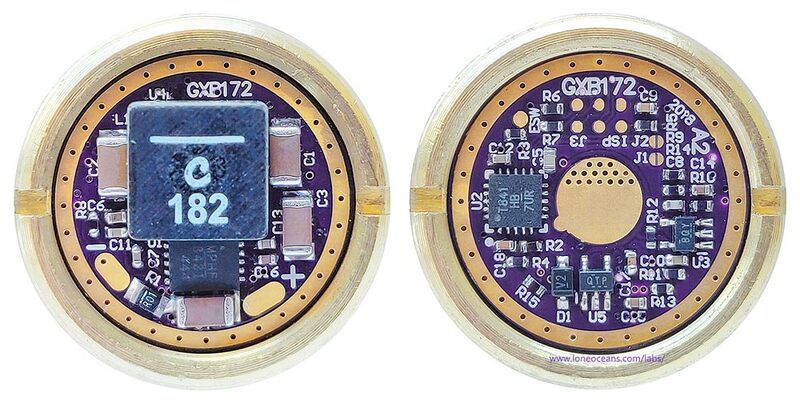 The design of the GXB202 is identical so the same firmware can be used. With the design optimized after tinkering around with the dev platform and the firmware completed I completed the final layout of the form-factor PCB and sent it off for fabrication. With the PCB layout done, I sent the boards for fabrication. 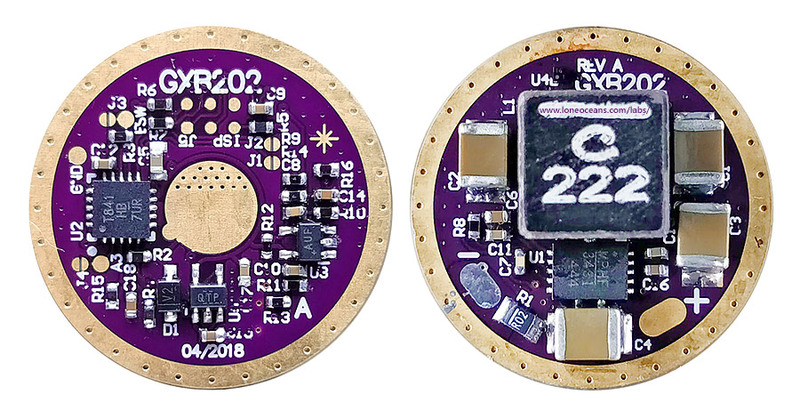 I designed these boards with OSHpark's 4-layer specifications and constraints in mind. The boards are very small so they came back nicely. A quick check yielded no broken or shorted connections that I could find, and I quickly went ahead to solder this up. Because the components are fairly small, the difficult-to-solder parts (inductor and boost IC) were reflowed using careful application of solder paste with a needle and a reflow oven (the 4BGA temp-IC doesn't need additional paste, just a bunch of flux). The rest were soldered on manually by hand using needle tweezers, a fine-tip iron and thin solder wire. I put some boards together and I'm happy to report that the only mistake I found was a single silkscreen error (C10 placement), but electrically it all turned out good! Here's how it looks like, top and bottom. Above is it pictured sitting in a Convoy S2+ brass pill which is my candidate flashlight for this driver. Note the big pads for + and - to the LED, as well as programming header pads (ISP), E switch pad (SW), two additional jumpers (J1 and J2), and one more auxiliary pad (A3) which can be use to power an extra LED, or something else (e.g. I used this for a debugging LED during firmware development!). Above shows a side view of the driver. 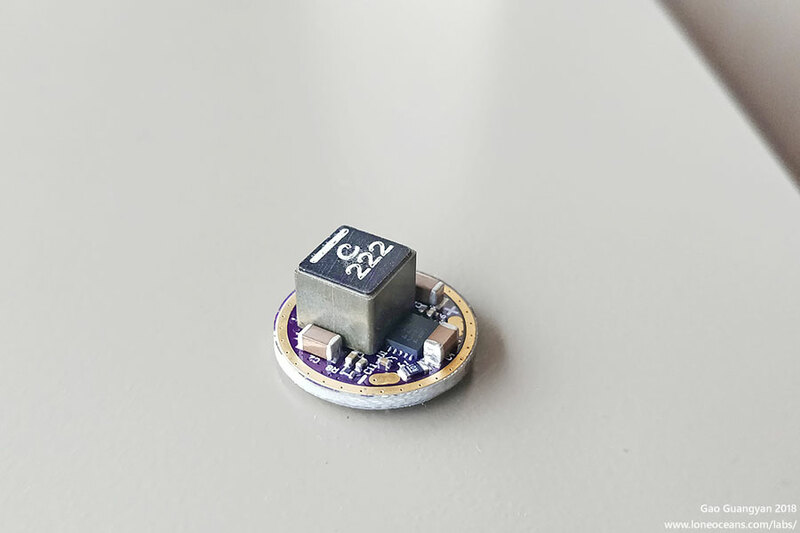 The big inductor can be easily swapped out for a smaller shorter (3mm tall) one if your host doesn't have space for a ~7mm tall inductor. Using a bigger inductor allows better performance though with a higher inductance (desirable) and lower DC resistor (desirable). Fortunately the board came together without too much difficulty and I never had any problems with the assembled boards- but I suspect for most hobbyists, this may be a challenging board to assemble! With the first few GXB172 drivers soldered up, it was time to put it to the test in a flashlight! - Note, I tested them on the bench first with a dummy LED just to make sure they were working, before putting them in the host. Fortunately, no problems were found in the layout and everything worked first time around! A few small changes were made to the GXB172 at the start of 2019 - a silkscreen error was fixed, a bleeder resistor (for some tailcap light switches) was added, and components were move slightly to allow a little more clearance for the retaining ring. Above shows the completed GXB172 Rev A2 ready to be assembled into the brass pill of the Convoy S2+ host (after soldering on spring and wires), along with a 4500K 90CRI Nichia 144AM 6V LED on a Clemence-designed 16mm aluminium core PCB. The electrical design remains identical. With the GXB172 driver verified to be working as intended, it was time to put it inside a flashlight. 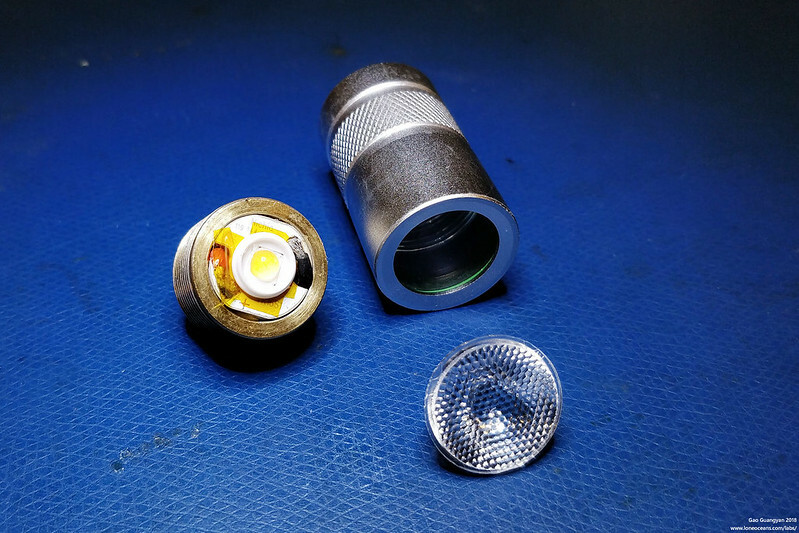 For my first build, I opted to make a high-CRI flashlight with one of the very best multi-die LEDs available (as discussed above in this page). This will not be an ultimate lumen monster, but instead, a still-pretty-bright ultra-compact flashlight. 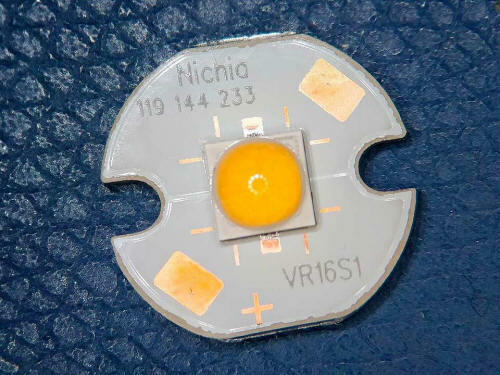 The LED of choice is the Nichia NV4W144AM sm563 E1000 R9050 LED, mated with a 16mm VR16S1 aluminium MCPCB designed by Clemence. This LED was reflowed onto the heatsink using solderpaste and a reflow oven. When assembled with a GXB172 at 6A at around 6.5V, we should be able to get about 2500 lumens of beautiful 5700K 90+CRI light. The flashlight host of choice was the venerable Convoy S2+ which is often available for just about $10 or so. 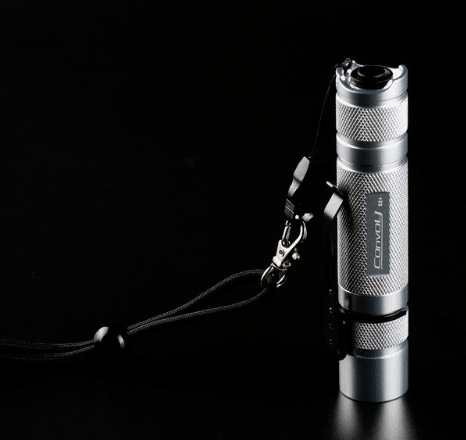 Convoy is one of the most popular brands of fairly high quality flashlights. They are based in China, and over the years, have produced not only excellent flashlights, but have also taken their customer feedback very seriously yet keeping quality very high. The S2 line is one of their most popular, and designed around a single 18650-cell, a 17mm driver, and a 16mm LED PCB. I was recently able to purchase one such host, but this time in a very nice clear/anodized finish, showcasing the beauty of the aluminium. I also bought a short-battery tube replacement. Powering the flashlight is a WindyFire 18350 700mAh 3.7V cell, one of the best hi-drain small cells I had on hand. First I had to solder on a spring. It looks a little funny but it works just fine inverted. As discussed previously, this was a 3.8-7.6mm x 10mm x 0.8mm bronze spring from Kaidomain. 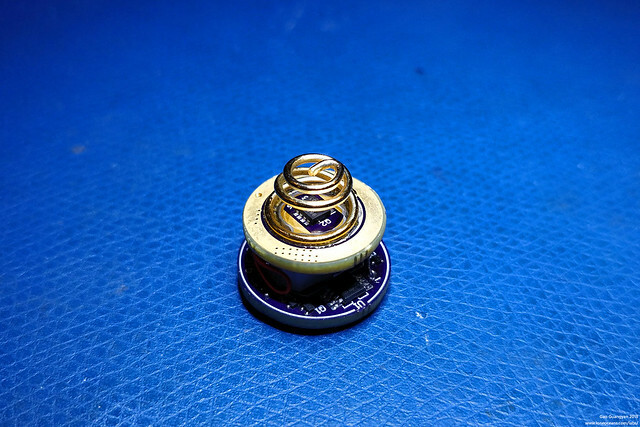 Solder-wick was used for spring bypassing to reduce ohmic losses. With the driver in the pill, next is the Nichia LED. Now this is not the most efficient of LEDs in terms of being a lumen-monster! Djozz has tested this E1000 LED and it 'only' puts out ~2500 lumens at a 6A ~6.4V drive. But I really wanted to make a high-CRI flashlight while still being very bright. Don't worry, I have a J4 XHP50.2 LED up next for a >4000 lumen light which will be coming next. The MCPCB was placed into the brass pill with Arctic Silver 5 thermal paste. Then it was time to put everything together..
... and it works exactly as expect with all the modes and functionality working! Because I've configured this light to be a 'shorty' build, having it run at my originally intended 6A output would lead to a ridiculous ~3 to 4+ minutes of runtime on the 18350 battery (thermal throttling will kick in before that though), so I later changed the modes for a more reasonable 4.2A LED output (measured and verified). The result is about 2250 lumens of beautiful CRI 90 Nichia light! Once problem though which I quickly encountered with the Nichia 144 LED and the regular mirror reflector on the flashlight, was that the beam profile was fairly ugly to say the least! Due to the phosphor deposition on the 144 LED die, the resulting beam pattern was very much like a 'fried egg', being very yellow in the middle, and turning cooler towards the edges. In order to solve this problem I decided to swap out the mirror reflector with a Total Internal Reflection honey-comb diffuser instead. I purchased a bunch of different beam profile diffusers (different divergence) from Convoy's Aliexpress shop, and after some tested, settled on the 45 deg one. This produces a wider beam profile than the stock reflector, but it diffuses out the yellow hot-spot beautifully and the result is better than I could have hoped for! The TIR optic works really well and produces a much softer, wider beam (45 deg one used here), at the cost of slightly reduced OTF (out of the flashlight) lumens and reduced thermal performance (since the original mirror reflector was aluminium). Finally, I added some additional features to the light! I won't cover them in detail on this page, but you can bet that it wasn't just for looks! In fact, I consider them essential to operating the flashlight with the GXB172. The key reason is to reduce voltage drop at high current drain. Just some quick information - when doing bench testing of the GXB172 driver, I found that it was capable of drawing over 15A from a single cell. This is a pretty large current, and we start to see some major problems, specifically with switch resistance and longevity. In my previous lower-power GXB17/20 drivers (20W driver), these drivers often pull something like 6 to 7+A from my batteries. Recall that the first few hosts I used were cheap SK98-type flashlights, and I quickly found that the tail-switches were completely not up to the task of handling those load (they melt). Since then I've had two out of three of those switches fail, one where the contacts seemed to have welded together, and another got so hot it melted the casing partially and failed mechanically. Granted these switches are not as robust as the Omten1288 or similar branded switches used in the Convoys, but I was (1) uncomfortable with having the switches frequently switch and interrupt ~10 to 15A in my GXB172 driver, and (2) was encountering problems with the significant voltage drop across the switch resistance. I was able to measure the switch resistance for several random Omten switches, and they ranged significantly from ~40mR to 10mR, and varied depending on how got they got, and how used they were. Omten switches are technically only rated for 1-3ADC with a maximum contact resistance of <200mR (http://www.omten.net/pbs1288-push-button-switch/pbs1288b-push-button-switch.htm). The fact that people frequently use them in DD FET drivers at ~6 to 10A is quite amazing! However let's take a ~30mR average for a new Omten clicky switch. Even at 30mR resistance, at 15A, the voltage drop across just the switch is 450mV! Even for a high quality cell, at 15A discharge, this can result in the driver input voltage falling and approaching 3V. The result is far from ideal since the driver sees that the input voltage is low, but to compensate for a fixed output, it has to draw more current, causing the voltage drop across the flashlight contacts to increase, etc etc. The result is a detrimental feedback loop, eventually resulting in the driver sensing that the voltage is too low, and triggers battery protection, even when the battery is not anywhere near depleted. As a result, I created a prototype switch, replacing the clicky-switch with a very low resistance MOSFET. The result is the GFS16 tailswitch system (I will be writing a proper page on this), but it is an integral part of the GXB172 system. By replacing the mechanical switch with this system, the voltage drop across the tailswich drops by several 100s of mV, improving performance of the GXB172 significantly and greatly improves runtime. The GFS16 features an on-board tiny rechargeable battery which drives the gate of a very low R_ds_on MOSFET when ON. In addition, it features a very low-resistance Notigcon Beryllium Copper tail-spring removing the need for a spring bypass. And finally, it has some taillights... which add additional functionality to indicate if the battery voltage is low or not, and changes colour accordingly :). With that, the first GXB172 flashlight is officially complete! Back in 2017 when I first embarked on my GXB driver projects, the main target flashlight case was the SK98 with a zoomy lens. The flashlight requires as 20mm driver, so the GXB172 would not fit. However, I always thought that the flashlight would be a nice host for a XHP35HI LED since it would make a low-cost but decent 'throwy' flashlight. The SK98 requires a 20mm driver and a 20mm MCPCB. Importantly, the XHP35HI comes in only a 12V configuration. I thought it would be the perfect time for me to modify the GXB172 to a larger PCB, and test it out properly at 12V-out configuration. After a little bit of time, I managed to complete the GXB202! - the 20mm version of the GBX172! The larger board size allows for much better clearance around the board as well as more space for larger passives. I was able to use 1210 capacitors for both input and output rails, and I was also able to relax placement of other components and pads. Otherwise, the layout and schematic remains identical and both driver sizes share the exact same firmware and functionality. This particular build was optimized and compensated for a nominal 2.5A 12+V output. As a gift for those who are reading closely, here's the board files for the GXB202 Rev A... ;) The motivated can try to assemble one themselves with a little bit of modification to the GXB172 BOM..
For the LED, I chose the highest bin XHP35 HI I could buy (sadly only a D4, 5000K, not the top-bin), from Kaidomain, together with their in-house MCPCB. This was installed into the pill with Arctic Silver thermal paste. The GXB202 driver was installed and it fit perfectly. In this case, the GXB202 was configured for 12-14V+ output with a maximum of 2.5A drive. A BLF forum member TA measured 2570 lumens from a E2-bin LED at 2.5A, so this LED should be putting out a good ~2396 lumens at 2.5A drive current. A bench test was also conducted at a variety of power levels (just before I trimmed the wires and put it all in the flashlight), ranging from the lowest setting (about 2-3mA @10.2V) to the LED, all the way up to 2.50A at 14.70V (36.75W to the LED). Battery input was measured at just over 40W, giving us about 90% total efficiency (including wires etc, probably a little better in a well-put-together flashlight), with higher efficiency (>95%) at more realistic power levels. I'll probably do a quick write-up about the GXB202 in more detail in the future. Here are some results while testing the GXB172. Above shows a scope shot of an early GXB172 prototype in operation with a XHP50A LED in 6V configuration (on a heatsink), powered by a LG HG2 18650 battery. For this test, I wrote a very simple test program which ramps up the LED current from 0 to 6.5A linearly to see how it performs. Note that in this version, the inductor used was a Coilcraft XAL7030, which is a little less efficient than the XAL7070 which subsequent builds use. Above you can see the input voltage in yellow from a LG HG2 lithium battery (excuse the voltage drop, my battery cables were fairly long!.. and I had to use a battery since I had maxed out the 8A of my power supply! ), the output voltage (magenta), the output current (green) and the switch node (cyan). The driver was hooked up to a XHP50A LED on a copper MCPCB and clamped onto a heat-sink (same as the one in the photo above). Looking at the peak of the current drive, the GXB172 has an output of some 7.24V at 6.5A (47.06W)! This was at an input voltage of 3.4V and about 15.6A on the input (clamp meter measured) for a total efficiency of around 89% (efficiency is much higher at more 'reasonable' drive levels!). This is about as high as one can go without increasing inductor size (e.g. going up from the Coilcraft XAL7030 to say the XAL7070) and dropping the ripple current, since we want to have some headroom above the inductor and switch peak current! So far it seems like the driver is not thermally limited per-se, i.e. 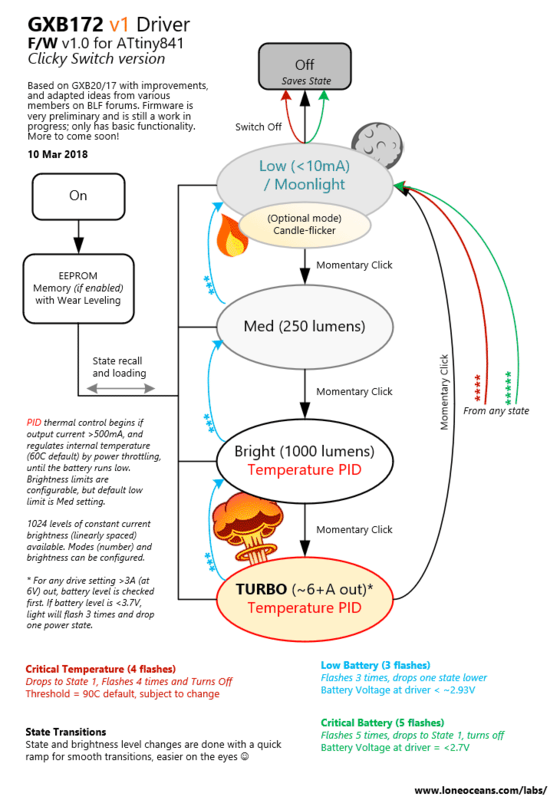 the LED produces so much more heat that it'll end up heating the driver up more than the losses in the driver. I put together a really quick video to show the GXB172 in action (preliminary firmware). Unfortunately, this video production is fairly poor quality so please excuse this; I'll make a better video in the future. In the video I go over the basic firmware functionality of the GXB172. The light is extremely bright, but my camera stops down pretty quickly. Also the candle-mode is a little silly right now since I'm using a 5700K LED (too blue). However I have plans for some nice, warm emitters which will be great for camping! (Note: this video was taken before the S2+ was outfitted with the improved TIR diffusing optic). Removal of any material from this site without permission is strictly prohibited and will result in infringement of copyright laws.br> Disclaimer: Projects and experiments listed here are dangerous and should not be attempted.